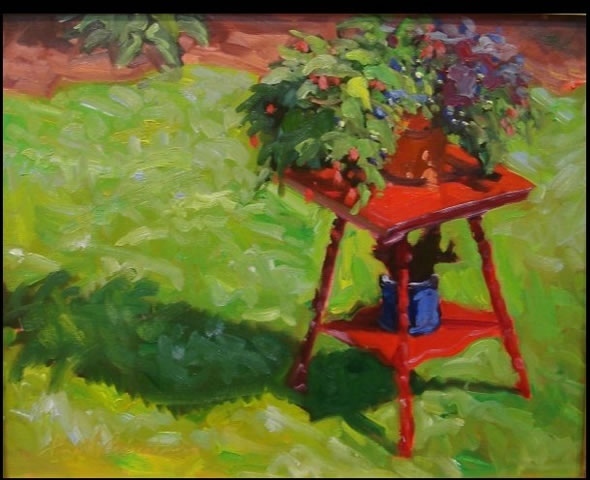 ,Pam paints en plein air, out of doors-from life, whenever possible. Her boldly colored landscapes are a direct result of intense observation. Her studio work is usually larger and more complicated, taking as much as two weeks to a month to finish. She has exhibited Nationally in many juried shows over the last 20 years and won many significant prizes. See resume for selected list. Two articles have been written in American Artist Magazine about her methods and paintings. See American Artist, December, 2002 Pages 14-16 and American Artist , June, 2003 issue. Pamela is a member of North Shore Art Association, Gloucester, MA, Rockport Art Association, Rockport , MA, National Association of Women Artists, and Oil Painters of America.